On 14 November 2014, H.E. 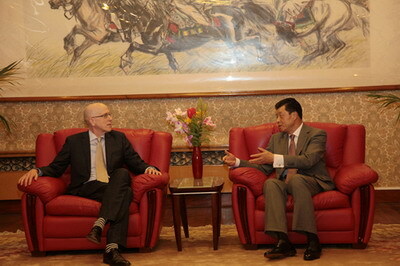 Ambassador Liu Xiaoming met at the Embassy with Jason Seiken, Editor-in-Chief of the Telegraph Media Group. Chris Evans, Editor of the Daily Telegraph and Ian MacGregor, Editor of the Sunday Telegraph were also present. Ambassador Liu said the Telegraph Media Group, the Daily Telegraph and the Sunday Telegraph have a large readership in the UK, Europe and the United States. In recent years, the two newspapers have attached importance to, increased input in and expanded its coverage of China and played a positive role in helping western readers understand China. China attaches importance to developing partnership with the Telegraph Media Group and the two newspapers. Ambassador Liu talked about the recent Fourth Plenary Session of the 18th CPC Central Committee, highlighting the decision on comprehensive advancement of the rule of law and its far-reaching impact on China’s development and reforms. He hoped that the Telegraph Media Group and the two newspapers will see the whole picture of China’s development, get a deep insight into China’s political system and development pattern, report on China in a comprehensive and objective way and show the world a growing China, a real China. Seiken and his colleagues said China is one of the most important and fast growing countries. The Telegraph Media Group and the papers have attached great significance to covering China. They are ready to continue to follow events in China, make active efforts to report on China, and are ready to deepen and expand cooperation on digital media with China. Ambassador Liu also shared China’s views and position on China-UK relations, China-US relations, China-Russia relations, the situation on the Korean Peninsula, the prevention and control of Ebola and the political reform in Hong Kong. The Telegraph Media Group is a media giant in the US. Founded in 1855, the Daily Telegraph is one of the most widely circulated newspapers in the UK with an average daily circulation of around 540,000. Founded in 1961, the Sunday Telegraph, sister of the Daily Telegraph, has a daily circulation of 430,000 and some 1.3 million readers. Online versions of the two newspapers have 78 million readers.